All prizes remaining as of Saturday, October 30. 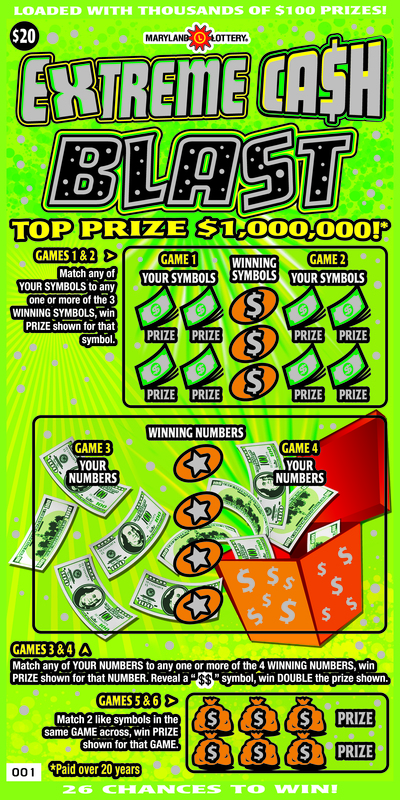 Don’t forget to enter your LUCKY CODE for a chance to win up to $10,000. 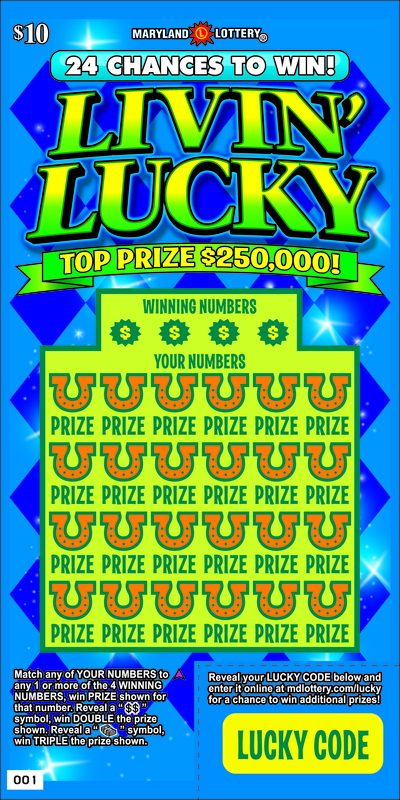 For more information visit, mdlottery.com/lucky. 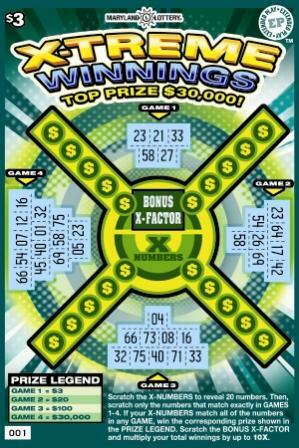 This entry was posted in Hot Five, Scratch-off and tagged blackout bingo, extreme cash blast, Hot Five, livin' lucky, Platinum Rewards, x-treme winnings. Bookmark the permalink. Are there still spicey 7’s game anywhere? Dee: That game is no longer available. I would like to know why it take so long for the daily numbers (Pick3, Pick 4, etc) to hit the computer when the number is drawn before 8. If you go into any lottery retailer , let’s say at 8:30 and ask for a printout, you ‘re told the number is not out yet. With modern technology and almost everything being electronic, why do it take so long..it should hit the retailer and computer at the same time. I have been in a retailer that have gone online to your website to get the numbers when its not available to the terminal yet. Please expalin why is that. Charlene: According to our Drawings Manager, here’s the low-down on why it takes a little while for lottery machines in our retailers to begin paying-out. 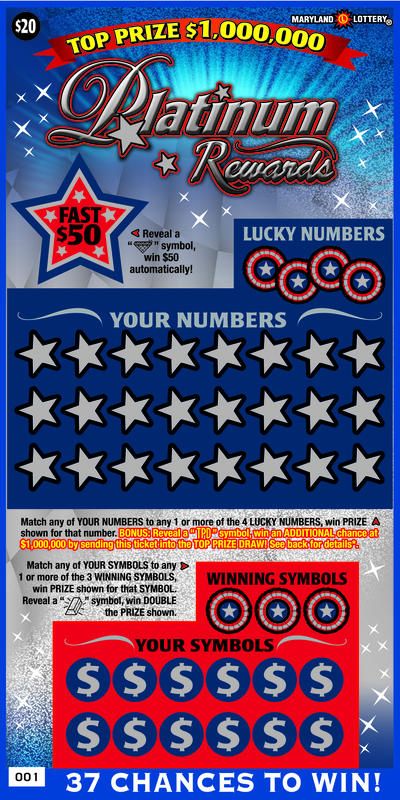 In the minutes after a drawing there is a very deliberate step-by-step confirmation process involving multiple lottery officials in different locations, all working to guarantee the accuracy of the just-drawn winning numbers. Once all involved agree, the numbers are then entered into the system – another slow, careful process. The goal, of course, is to make sure that there are no mistakes. To make sure that when our players are lucky enough to have correctly matched the winning numbers that they have a pleasant experience cashing their ticket. Are there still any Platinum Rewards left for sale in 21009, 21028, or 21050 zipcodes? I have been looking everywhere in Harford County! Thanks! Charlie: Try 7/11 #11634 at 5 Bynum Rd. were r the hot tickets sold in zip 20851 please tell……. Where can I find Player’s Club in the 20770 and 20716 area? Karen: Try Centerway Mini Mart at 109 Centerway Rd. If big 8 bingo is sold out then why is it still listed on the scratch offs remaining page and why has nobody claimed any of the prizes. Also how do you know it’s sold out if you don’t know where they are located during the final claim status. Quahog: Big 8 Bingo is in its final claim period, which is 182 days after the final activation date of remaining tickets to be sold. The final activation date by retailers was 8/13/2010. The final claim date is 2/11/2011. All I can tell you is that it is sold out of our warehouse. We don’t know if all books have been sold out by retailers. It is still on the prizes remaining page and will be until 2/11/2011, which is the date winners have until to claim their prizes, big and small. Are any Platinum Rewards left for sale in 21047, 21014, or 21015 zipcodes? I have been looking everywhere! Thanks! (Fallston BP is sold out). Charlie: Try the Fallston BP at 1515 Belair Rd. Also what percentage is platinum rewards sold thanks. mbee: Platinum Rewards is now 79% sold. mbee: Feel free to use the search bar at the top of the page to find Winter Riches related stories. Hi, I need to find out if I’m wrong about Livin Lucky. Are the tickets I send in from the beginning of the contest still good or I have buy new ones? Rozita: Yes, your entries are valid for the life of the contest. Shirley: Try Rockville Serv. Cntr. at 1900 Rockville Pike. james: Big 8 Bingo tickets are sold out. Where does one find the Platium Rewards in the 21234 area? PLD: Try Parkville Conv. at 7501 Harford Rd. When you say that a certain game is, let’s say, 75% sold, does that mean 75% of the printed stock has been sold to the retailers and the lottery commission still has 25% of the printed tickets? or 75% of all printed tickets have been sold to consumers from retailers, meaning all stock is out at the retailers and the lottery commission has none left? My retailer showed me a printout of games he can still ‘buy’ and games that are only ‘cashable’ to him but he can’t get any more of-just trying to make sense of that. Also, I purchased 20 aces and dueces from one retailer and 2 of them were winners however, I tried to cash them in at a different retailer and his machine kept saying “not your pack” and would not let him cash them in…what is that all about? he said I have to go back to where I got them! One more question-I bought a $20 card (it so happened to have been the last one on that roll too) plus many others at a local retailer and when I got to my car, I noticed the security number on the $20 card was already scratched off-I went back inside and brought this to the attention of the late night clerk who was very quick to jump and said since I had left the store, there’s nothing I could do about it-she seemed a bit nervous-this is a new store-and she was very young and it was very late at night-of course the card was not a winner-I won’t buy there again but is there a security department that checks up on issues like that? Thanks! Yes, when we give information out like 75% sold then that means that 75% of the ticket have been settled. The other 25% is in a combination of retail locations that have not yet been sold and also some could be still in our warehouse to be shipped to retailers. Your 20 ticket of Aces and Deuces sounds like retailer had not activated the book for sale yet. Retailers are instructed to activate the book prior to selling. You should be able to cash at any lottery retailer. The $20 ticket you purchased could have been tampered with if indeed your validation code was already scratched. I would be interested in the name of the location that you bought from, also I am also interested in the name of the location where you purchased the Aces and Deuces. We try to up hold the integrity of the lottery as best we can, but unfortunately when we have over 4,000 locations it is hard to control all situations. Please be aware we take any kind of incident very serious and will investigate if you supply the information. Do you want me to disclose those retailers here on public forum or email them to you or someone privately? Cheryl: Feel free to reply to this forum and I will not make them public. You can also send an e-mail to paffairs@msla.state.md.us. frank: We apologize for the inconvenience. I’ll send a request to our web update to have it implemented ASAP. what per centage of super bonus crossword has been sold? I use to win on the bonus but I haven’t seen a winner in months. I buy this scratch-off often and at different locations. Just wondering. janice: Super Bonus Crossword is 43% sold. How can I find out which retailer carries the most variety of scratch offs? I stop at some places and they have 6 and some have 20+; also, which Greene Turtles carry Keno/Racetracks and scratchoffs? Thanks! Cheryl: Please provide a zip code and I can give you a list of a few place that carry the most scratch-offs in your area. Keno and Racetrax is available at all Maryland Lottery retailers. Quarterfield Liq at 7702 Quarterfield Rd. Doc’s F & B at 7067 B & A Blvd. Champion Liq at 7385 Baltimore-Annapolis Blvd. Fort Meade Shell at 2631 Old Annapolis Rd. Can you tell where the following scratch-offs are in 21157 zip code? Raise Stakes, Hot Streak, Reeses, Blackout Bingo, Red Hot Blue 7s. Steph: Try Country Liq. at 531 Jermor Lane. Jim: Hot Streak and Raise the Stakes are in final claim status and we are unable to determine if books are still available. You can try Tom’s Liq. at 1592 Annapolis Rd for Red Hot and Blue. What is the percentage sold for Set 4 life 2? heather: Set 4 Life is 95% sold. Scratch-off’s: Is there anyway you could post weekly updates on the percentage sold, per scratch-off? Just A Chance: We are in the process of making improvements to our website. Please look out for these updates in the very near future. Where can I find Extreme Cash Blast in the 21236 zipcode? Thanks. Pat: Try A & M Conv. at 7400 Belair Road. Where can I find the Turkey Day scratcher. Thanks! Karen: Please provide a specific zip code and we’ll be happy to look that up for you. Anywhere in the 20770, 20716 or 20912 area. Thanks! Karen: What games are you looking for? jason l: Try the Edgewood Amoco at 2201 Pulaski Hwy. I have been looking everywhere! Thanks! Charlie: Try the Fallston BP at 1515 Belair Red. SherylsKitchen: You can try Aspen Hill LBW at 13745 Connecticut Ave. The game is 95% sold. I mailed in a 2nd chance ticket, my quest…how long does it normally take to respond back ? BIG JER: You will be contacted in the event that you are a winner. What number on a roll does a big winner usually hit. Can a big winner be anyhwhere on the roll if is even in that roll. thanks. Im gonna keep playing hopefully I can win. I have 2 tpd cards i havent sent in yet. I also had one more lucky that I lost but it seems as if ill never win that any way. mbee: Winning tickets are distributed randomly throughout an entire game. There is no pattern as to where winning tickets will occur. Your answer wasnt clear. So you are saying that a big winner can be anywhere on roll. mbee: Yes, they can occur anywhere throughout the roll. sirwhite: Raise the Stakes’ final activation date has occurred. We can not accurately pinpoint where these games are as it is now in final claim status. what is the percentage sold for Money, Money, Money, Casino Royal and Winter Riches? J Robert: Red Hot and Blue is 94% sold. Where can i find Win it all and Black Cherry Doubler and Hot streak in or near the 21040 area code ? Hot Streak is in final claim status and we can not locate where books remain. You can try 7-11 at 1020 Gateway Rd for Win It All and Black Cherry Doubler. E WAGNER: First off congratulations! This is the first inquiry of its kind. Please feel free to contact the security division at 410-230-8800 if something like this pops up again. We will also monitor this situation closely. I am in need of holiday $$ but my 1023 just won’t hit. HELP!!! The lottery can’t help you . Get a second job . 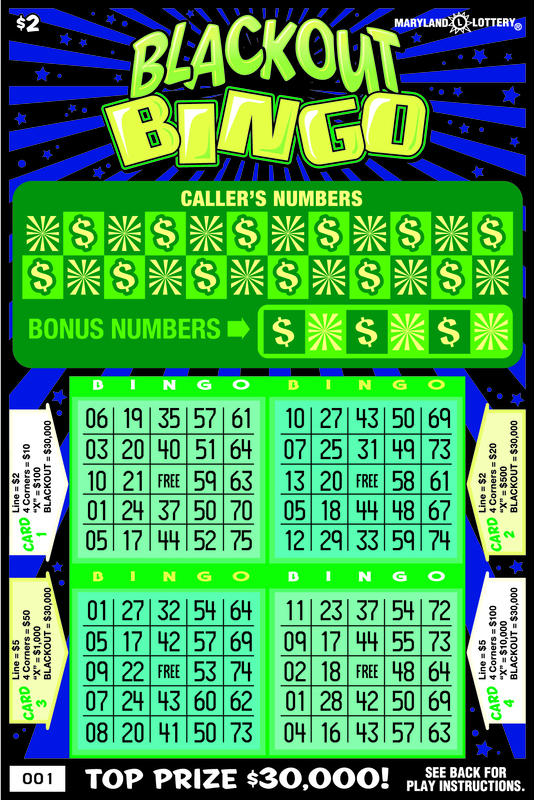 Can you tell me if there are any locations in the 21237, 21206, 21220, or 21236 zip codes that still have Big 8 Bingo? Toya: Big 8 Bingo is sold out. how could big 8 bingo be sold out if there are 3 top prizes among many other smaller prizes listed on the scratch off page? david: Big 8 Bingo is sold out. It is in the final claim period and we are awaiting the lucky winners who purchased those tickets to come forward. Can anyone tell me where to find Big 8 Bingo or 3D Jackpot around the area of 21666? Mary: Both of these games are sold out. WHat percent is raise the stakes and hot streak sold now thankyou. mbee: Raise the Stakes is 99.7% and Hot Streak is 98.5%. What percentage of Reese’s tickets remain and what types of winners remain? Garry: Reese’s Scratch-off is 89% sold. You can see what prizes remain here. I live in the 21133 zipcode. Where can I find Blackout Bingo tickets? Garry: Give 1 Liberty Mart at 8625 Liberty Road a try. What is the percentage of Reesee Hit It Here and Boxed Bingo tickets sold? Pat: Reese’s is 89% sold and Bingo Boxes is 37% sold. Hello! Can you find out if there are any remaining Raise the Stakes scratch-offs in the 21136 or 21784 areas? Thanks. Hopeful: The final date to activate has occurred for Raise the Stakes, unfortunately we are unable to pin point where any books remain. How can the final claim date for Raise the Stakes have occurred when the website clearly states . If this is the case I want MD lottery to gove me my money back. I would not have purchased tickets that could not be cashed in. Angela: My mistake. I got my terms confused. Raise the Stakes final activation date has occurred. It is now in final claim status with the final claim date being 4/22/2011. I live in 21077-right around the corner from the hot topic item on the ballot today-the slots!! Is there anyplace within 100 miles of me that has Big Bucks Party Pack, 3D Jackpot or World Championship Poker? Yes, I really would travel that far! I have a permanent callous on my finger from ‘scratching’!! nevermind…that post was posted before the 11/5 last day to claim date so responding now, after that date, is not necessary! Cheryl: Unfortunately they are sold out. The final activation date for these games was May 7, 2010. The final claim date was November 5, 2010. I have a questions about final activation dates. I was playing Big Buck Party Packs like crazy. After the final activation, I went to get them (I can name at least 3 different locations) where I went back (sometimes the next day) and was told that a lottery agent picked up the remaining tickets because they were no longer allowed to sell them. I consider this a scam on the public. When you say a game is sold out, I no longer believe you. Books should be sold in their entirety and or there should be a specific location in each county for patrols to purchase these tickets. Please clarify this sore subject for me. Many things are factored into closing a instant ticket game. Prizes remaining is one factor, although we have sold tickets even though all top prizes have been claimed, we make sure there are still tangible prizes remaining. Inventory remaining is another factor in the decision to close a game, you can’t sell the game if there is no inventory. When a decision is made to close a game this is how it happens, Retailers are notified of the last activation date 30 days prior, once the last activation date passes customers have 182 days to cash in all winnings. Retailers may continue to sell the game up until the final claim date or could have the lottery pick up any partial books or full unopened books. The lottery strives to sell through each and every game, but as you can see other factors are involved that may not make this happen all the time. Across all games and price points we average about 97% sell through. Hope this helps. who won the reeses peanut butter cups trip to sarasota for the non winners of the fan of the game??? Chris: Lillie May Campbell from Baltimore won the trip to 2011 Orioles Spring Training through the Hit It Here contest. Will: Yes, you are eligible for the 2nd chance drawing. Hi, I know you would like to sell the rest of the remaining “HOT STREAK” scratch offs, & many of us would like a chance to win one of the remaining prizes ! Since it’s 99% or more sold, how about a post of were the remaining tickets could be found, or even zip codes of area’s they are in? It would be fun just trying to find that “needle in the hay stack !! Any Tickets on the Eastern Shore ?? Ed: Because we never know where inventory will be from day to day, we can not publish where scratch-off tickets are available. 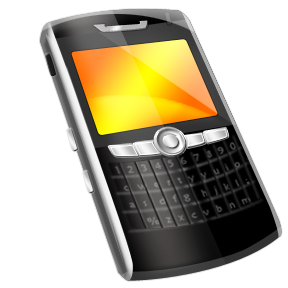 We can take “search” requests on a case-by-case basis. If you provide a specific zip code, I can try to give you an answer on where to find Hot Streak in your area. What is the percentage sold for jumbo cash doubler and players club? Natasha: Jumbo Cash Doubler is 40% sold. Players Club is 32% sold. the $20 scratch off that has TPD is a ripoff im not a loud person but i would rather not win insted of 4th spot says TPDyou cant even enjoy the $ that has been spent.Ilove playing scratchoffs at southdown liquors.avery pleasent place to spend a few min. and great people there. Where can I find Extreme Cash Blast & X-treme winnings tix in 20685 & 20657 please? November’s HOT FIVE are far superior to the October picks. Thanks. Livin’ Lucky seems to be selling slowly. How many were printed originally? Where are they located here (20685 & 20657)? Ozzie: Try CJS food Store at 12020 Rousby Hall Rd.